Now that Vladimir Putin has acknowledged his responsibility for invading Ukraine in February 2013, finding out about his worldview is no longer a matter of mere curiosity. Putin’s statements of the last decade demonstrate that his thinking about Ukraine and Russia is deeply mired in history. Already in 2005, reminding the upper chamber of the Russian parliament of “how contemporary Russian history was born,” he called the collapse of the Soviet Union the “greatest geopolitical catastrophe of the century.”  The remarks that followed made it perfectly clear that “geopolitical” was not a slip of the tongue. He did not mean the imploding system of social security, post-Soviet economic decline, and people’s misery, reflected in plunging life expectancy. He meant exactly what he said: that the disappearance of the Soviet state’s borders was a disaster for the Russian nation per se. Why was the disappearance of this particular border a disaster? According to Putin, it left “tens of millions of our fellow citizens and compatriots outside of the borders of the Russian territory.”  Apparently, he imagines that the Soviet Union was an exclusively Russian state. If the founding fathers and subsequent rulers of the USSR heard this statement, they would be spinning in their graves. The whole point of signing the Union treaty in 1922 was to create a federation of free and equal socialist nations, ending Russian oppression of other nationalities on the territories of the former Russian Empire. Imagining history as the story of nations, and its main characters as endowed with property, winning and losing is extremely dangerous for any statesman. Few would deny that the real and greatest catastrophe of the twentieth century was the Second World War, which claimed the lives of at least 60 million people, or 2.5% of the world’s population. The main culprits in that twentieth-century Armageddon were not the borders that changed in 1918 but political leaders, who attached near–sacred significance to their nations’ borders. Unfortunately, Ukraine happened to be on top of Putin’s list of wrongs that allegedly have been done to the Russian nation. It is no accident that Putin made his first frankly revanchist “geopolitical” statement less than a year after the Orange Revolution in Ukraine. The Orange Revolution was a profound shock to Putin, who, it is clear, believes that most of Ukraine on some profound ethnic level is Russian and ought to be part of the Russian political space. In 2008, alarmed by Ukraine’s attempt to join the NATO Membership Action Plan, Putin delivered his first “analysis” of Ukraine: “in Ukraine one–third are ethnic Russians. According to the official census alone, there are 17 million ethnic Russians out of a population of 45 million.”  (The only census completed in independent Ukraine in 2001 revealed 11,333,000 ethnic Russians). In the same speech Putin claimed that the Crimea was 90% Russian (58.5% according to the same 2001 census), and that there are “only Russians in the south, the entire Ukraine’s south” (the Crimea is the only region in Ukraine with a slight Russian majority). Where does Putin get his facts if not from empirical data? There is no denying that his version of Ukrainian and Russian history stands behind his misapprehension of the present. Putin’s vision of history includes an element of the canonical Stalinist version of Ukrainian and Russian history. For example, Putin claims that “contemporary Russian statehood has Dnieper roots … Kievan Rus was the foundation of the future, enormous Russian state….”  The Soviet historical narrative also presents Kievan Rus? as the “common cradle” of Ukrainians and Russians. The vicissitudes of history forced them to part and they suffered; eventually, after many struggles, they came together and were able to consummate their happy union. Clearly, Putin also believes in this romantic story of peoples destined for permanent union. He claims that Ukraine’s development, modernization, and industrialization were possible only in the Russian state. Faithful to his view of Soviet statehood as Russian, Putin presents even the post-World War II reconstruction of the Ukrainian economy as Russia’s gift to Ukraine. Today, however, the Russian nationalist and imperialist narrative has definitely eclipsed the Soviet story about two brotherly peoples in Putin’s thinking. First of all, Putin is denying Ukraine’s unique and separate identity. In 2013 he said that “… Russia and Ukraine are… essentially one people…. We have a common tradition, common mentality, common history, and common culture. Our languages are very close. In this sense, I repeat again: we are one people.” For Putin, “the identity of the Ukrainian nation,” understood as language and folk culture, is “part of our great Russian world, Russian-Ukrainian.”  Clearly, he acknowledges Ukrainian identity only as a regional version of the greater Russian one. It has been said that Catherine II could make four mistakes in a three-letter word, and here Putin managed to make a dozen in a single sentence. Kharkiv, the center of the Ukrainian Cossack regiment in the seventeenth century, never belonged to the short-lived “province of New Russia.” Since it was the first capital of the Ukrainian Socialist Soviet Republic, founded in 1919, it could not have been transferred to Ukraine from Russia in the 1920s. “New Russia” could hardly be conquered from Novorossiisk because the town itself was founded only in the 1830s, when Catherine II and Potemkin were long dead, and, like Kharkiv, it was never part of the region once called “New Russia.” The regions listed by Putin did not belong to Ukraine during the “tsarist period” for the simple reason that there was no “Ukraine” either as a state or an administrative unit in the nineteenth century. Finally, the core of the original province of “New Russia” was the Ukrainian Cossack republic of Zaporizhia, which was destroyed by Russian troops in 1775. This vision of “New Russia” as a Russian territory with its center in Novorossiisk (the only city in Putin’s “New Russia” list located in Russia), is deeply ingrained in Putin’s mind. Several months later he would repeat this story nearly word for word: “Historically, these lands have always been New Russia (Novorossiia). Why? Because, essentially, it was a single region with its center in Novorossiisk. These are the regions of Kharkiv, Luhansk, Donetsk, Mykolaiv, Kherson, and Odessa.”  In these fantasies about “New Russia” three elements come together: 1) these are the spoils of Russian imperial conquest; 2) they are ethnically Russian or dominated by Russian culture; and 3) they amount to half of Ukraine’s territory. In reality and to Putin’s great distress, independent Ukraine by its very existence, with its Ukrainian-Russian bilingualism and distinct historical narrative about events and people from Russian history, has rejected Putin’s vision of the Russian nation as a “Russian world,” an imperial civilization that has systematically swallowed the cultures of the peoples it controlled politically. Putin’s vision of the imperial Russian nation cannot accommodate the present-day Ukrainian nation-state. Therefore he has resorted to dismantling Ukraine bit by bit. Besides the “southeast,” Putin also singles out an evil western Ukraine “where present-day nationalism flourishes and even neo-Nazism is reviving….” In his distorted view, these territories belonged partly to “Czechoslovakia, partly to Austria, Austria-Hungary, partly to Poland, and nowhere were they [Ukrainians] full-fledged citizens of those countries.”  Putin is oblivious to the fact that the Ukrainian peasants in the Austrian Empire could vote and be elected to the parliament as early as 1848, while even half a century later, in the Russian Empire, his own grandfather could not do so because the country lacked any form of political representation. He forgets or is simply ignorant of the fact that in Austria the constitutional laws of 1867 guaranteed the cultural rights of Ukrainians and other nationalities, while in the Russian Empire they were brutally trampled for another half-century. Putin is prepared to stretch his elastic—and elusive—concept of the “southeast” so that it encompasses everything that can be accommodated within the new Russian state. Putin repeatedly invokes history, which he sees in terms of the deeds of real nations and states, in order to deny Ukraine any historical agency. He claims that “Ukraine, without a doubt, is an independent state,” only to qualify in the very next sentence that the existence of present-day Ukraine is an unfortunate quirk of history: “History wished it so, it happened so.” In his speech on the Crimea delivered in March 2014, speaking about Ukraine’s independence, Putin uses the Ukrainian word samostiinist instead of the Russian nezavisimost, in order to convey what he thinks is the unnatural and simulated character of the Ukrainian state. Since, according to Putin, Ukraine has never been an agent of history on its own, he believes that both the 2004 Orange Revolution and the 2014 Revolution of Dignity in Ukraine, popularly known as the Maidan, were anti-Russian coups staged by the West in Russia’s backyard. Putin is convinced that in 2014 the West used “nationalists, neo-Nazis, Russophobes, and anti-Semites,” while the interim Ukrainian authorities were “the ideological heirs of Bandera” (a Ukrainian nationalist leader in the second-quarter of the twentieth century). Since he brands Bandera as “Hitler’s henchman,”  Putin is implying that the true heir of the Nazi system is today’s “West.” Ultimately, for Putin, in history as well as in the present, the game is actually between two real players—Russia and the West—and not between Russia and Ukraine. Putin’s historical illiteracy is nothing unusual in today’s world. He, however, believes that he knows history and is able to draw on “the lessons of history.”  One history lesson that I am trying to convey to my students is that fantasies should be taken seriously when espoused by the leader of a large state. In the twentieth century the world community made the mistake of neglecting one leader’s fantasies and paid dearly for this political myopia. We should not step on the same rake again, and revanchist lunatics should not be treated as sensible and pragmatic politicians. “Poslanie Federal’nomu Sobraniiu Rossiiskoi Federatsii,” 25 April.2005 (http://kremlin.ru/transcripts/22931). “Obrashchenie Prezidenta Rossiiskoi Federatsii,” 18 March 2014 (http://www.kremlin.ru/news/20603). “Vystuplenie Vladimira Putina na sammite NATO (Bucharest, 4 April 2008), (http://www.unian.net/politics/110868-vstuplenie-vladimira-putina-na-sammite-nato-buharest-4-aprelia-2008-goda.html). “Stenogramma vystupleniia Vladimira Putina na zasedanii kluba ‘Valdai,’” Rossiiskaia Gazeta, 19 September 2013 http://www.rg.ru/2013/09/19/stenogramma-site.html). “Priamaia liniia s Vladimirom Putinym,” 17.04.2014 (http://kremlin.ru/transcripts/20796). “Obrashchenie Prezidenta Rossiiskoi Federatsii,” 18.03.2014 (http://www.kremlin.ru/news/20603). “Zasedanie Mezhdunarodnogo diskussionnogo kluba “Valdai,” 24.10.2014 (http://kremlin.ru/news/46860). 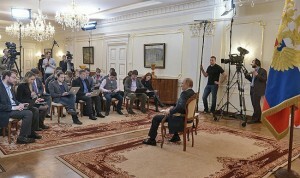 “Priamaia liniia s Vladimirom Putinym,” 17 April 2014 (http://kremlin.ru/transcripts/20796). “Zasedanie Mezhdunarodnogo diskussionnogo kluba ‘Valdai,’” 24 October 2014 (http://kremlin.ru/news/46860). “Vystupleniie Vladimira Putina na samite NATO (Bucharest, 4 April 2008), (http://www.unian.net/politics/110868-vistuplenie-vladimira-putina-na-sammite-nato-buharest-4-aprelya-2008-goda.html). Had the author been less selective in his choice of quotes, he would have also quoted a more recent and not less significant pronouncement that Putin made: “Those who do not regret the collapse of the Soviet Union do not have a heart; those who want to restore it do not have a brain.” https://www.youtube.com/watch?v=TSI7WJW8wqE Criticism of the limited historical knowledge of poitical leaders is certainly a salutary thing, yet such criticism should focus on all the protagonists of the current political drama and not just one of them. Otherwise, the reader may get an impression that what is the author does is propaganda. And then, however laughable Putin’s historical mistakes about Novorossia may be, the author should not assume that there is no one around to remind him that the governor-generalship of New Russia existed for most of the 19th century. In fact, its history is only a few years shorter than the history of Ukraine that we now see on the map. Don’t get your point, Vitya. How does any of what you say change anything that was written in the article? What remains unsaid is as important as what is said, that is the point. I criticised the author not for what he said, but for what he failed to say and yet should have said if he wanted to keep a critical distance from the dominant discourse. Well it is also dangerous to do so for historians. You spend the entire article bashing Russian nationalism (and rightly so), but at the same time you praise and in fact fuel Ukrainian nationalism, both in its current form and by imagining it into the past. Also I completely agree with vitaky 2001. Cannot ignore the other side of the story. Have to address it. Politicizing historical discourses is equally dangerous. Putin’s partial fabulation about the Kievan Rus and Crimea do not diminish the fact that in 2014 the West (specifically European financial interests, and the CIA under Republican influence) used ultra-nationalists, neo-Nazis, Russophobes, and anti-Semites to promote the asset stripping of Ukraine. The November elections may have changed matters somewhat (for example, Svoboda lost 31 seats), at least one hopes so.